Bitterpan is NOT fenced and a Tourism Assistant is on duty at all times. The reed cabins are built on stilts overlooking a waterhole and salt pan. There is a large communal cooking area with two reed cabins on either side of it. The camp is situated in the center of the wilderness opening up a new 4x4 route through the Kalahari dunes from Nossob to Mata-Mata and the Kalahari Tent Camp. It is on a ONE-WAY route starting from Nossob. It is approximately a 2,5 hr drive from Nossob to the camp and from the camp to Craig Lockhart on the Auob tourist road takes another 2.5 hrs, and thereafter 15 minutes to Mata-Mata, or a two hour drive to Twee Rivieren. It is strictly a 4x4 route, but BIG 4x4’s such as Unimogs (heavy vehicle 4x4) are not allowed. Guests should consider staying at Nossob before their departure for the camp, as it is an approximately 3 hours drive from Nossob along a one-way 4x4 route. Guests much check in to the camp at Nossob. They cannot do so at Twee Rivieren or Mata-Mata. Nossob itself is at least a three-and-a-half hour drive from Twee Rivieren. The camp faces west so lighting is good for photographs in the morning and you get to see and photograph the sunsets over the pan. • The camp and its access roads are strictly for the use of its residents only! 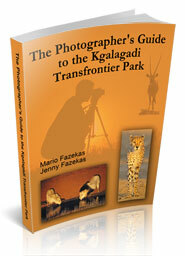 Photographs and information courtesy of SANParks.